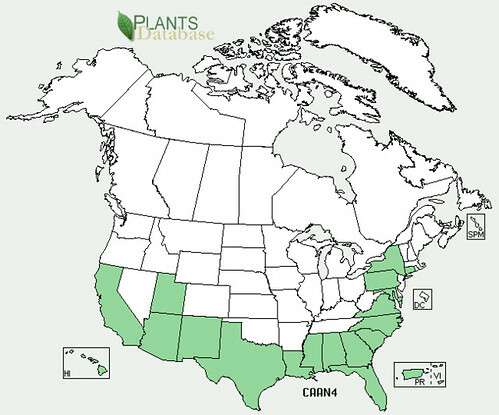 Chile pequin bushes are medium-sized, averaging about two feet high and three feet across. 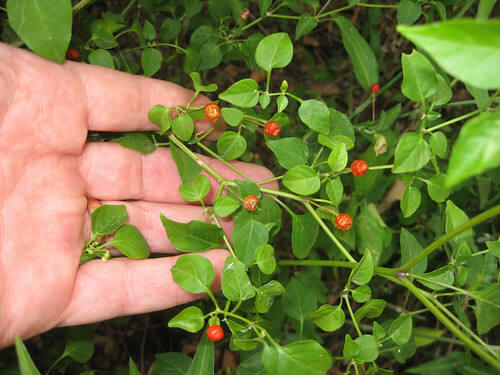 Close-up of Chile Pequin bush. 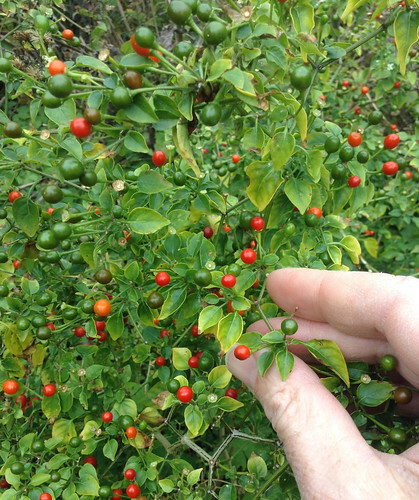 Chile Pequin fruit starts out green and turns red. Close-up of Chile Pequin fruit. Note the small size of both the fruit and the leaves. The tiny chile pequin peppers are some of the hottest known (Scoville rating 100,000 - 400,000) and add a wonderfully fierce fire and delicious, smoky flavor to dishes. They are hottest when they are young and green then lose a small amount of fire when they turn red but are still extremely hot. Use them any way you would a commercial hot pepper including sauces, salsas, or to add a "bite" to assorted pickled veggies or eggs. 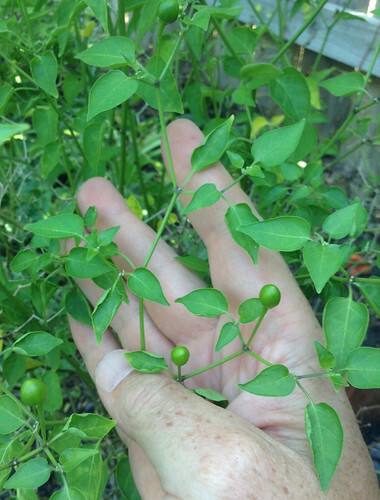 Dried, ground-up chile pequins are a common sight on the table of many older Texas families. 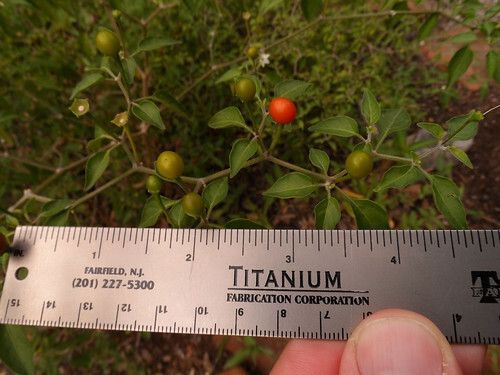 The peppers appear after the tiny white flower dry and drop off the plant. 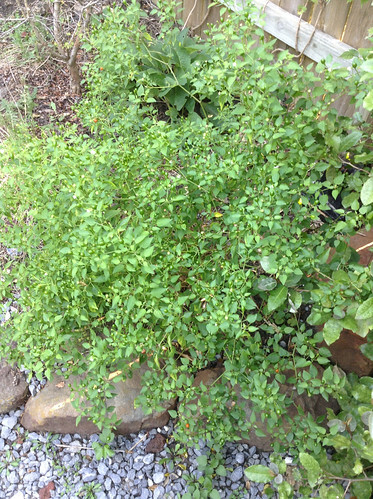 These bushes can not handle full Texas sun but usually grow best in the partial shade of some larger plant. They do need regular watering otherwise they'll drop their leaves if they get too dry. The bushes may be knocked back by frosts but will return if the roots survived. Mulch the plants in the fall to help protect the roots from the cold. 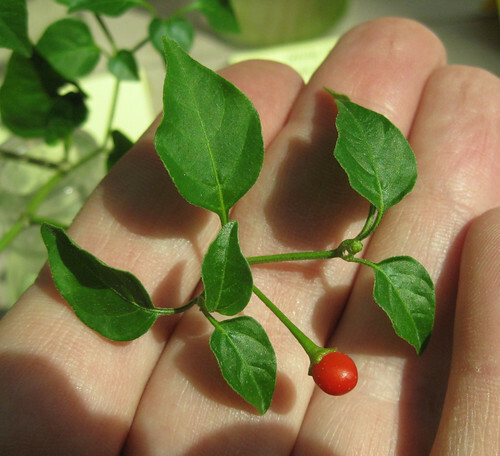 If several mild winters pass in a row chile pequins can actually achieve the size of a small tree! Growing chile pequins from seeds isn't easy as they evolved to pass through a bird's stomach where the acid weakens the seed's tough coat. You can mimic this acidizing by soaking the seeds in battery acid or pool-cleaning acid for 1-3 minutes followed by rinsing then planting. Generally handling the battery acid is a risky thing so if you try this make sure you are wearing safety googles, protective gloves, and old clothing. Also please dispose of the acid properly.